Tigerino Crystals cat litter has a new package design. It's still the same top quality litter, just with a new look! Please note: During the change-over period your order may include both the old and the new package design. Tigerino Crystals Flower Power Cat Litter has a gorgeous flowery fragrance, and can absorb nearly its own weight in liquid, locking away urine, odours and germs! The special crystals allow moisture to evaporate, while odour molecules stay bonded in the crystals. 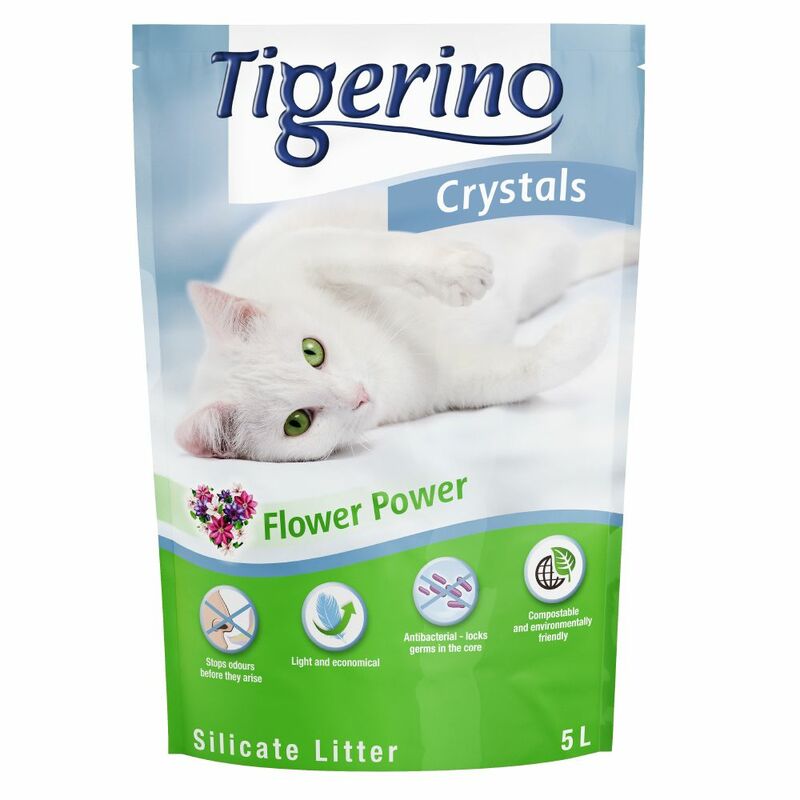 Tigerino Crystals Flower Power Cat Litter at a glance: Fresh flowery scent Stops odours in seconds Extremely absorbent - light and efficient Simple, dust-free use Anti-bacterial - seals germs in the core Compostable and eco-friendly How long does 5 litres of Tigerino last? : 1 cat: approx. 25-35 days 2 cats: approx. 15-20 days 3 cats: approx. 8-12 days Find the ideal acceΒories for your cat's litter at zooplus: Litter Disposal Bins Covered Litter Boxes Litter Deodorant Products.